Today’s featured plant is Common Mallow, Malva neglecta. Common Mallow is also known as button weed, cheese mallow, cheese weed, cheeses, dwarf mallow, garden mallow, low mallow, malice, round dock, round-leaved mallow, running mallow. (source) Note: These are not related to marsh mallows (Althaea officinalis), which are a different species and are the original source of marshmallows, the confection. Common Mallow is native to Europe, but has now naturalized through much of the United States and Canada, except for the extreme north and deep south east (see map). It is found in disturbed and neglected areas such as gardens, nursery pots, landscapes and lawn edges, barnyards, road sides, railroad tracks, vacant lots, etc. It prefers nicely moist to dry soils, and will spread in thick, choking carpets of foliage if allowed to do so. It has a single taproot and can be easily pulled when young, but it's tougher to pull once well established, and can tolerate mowing and weed whacking. The plant is a winter or summer annual or biennial, meaning that it may complete its lifecycle in one year or two, depending on conditions. (source) The leaves are a distinctive kidney shape with strong veining, and rise on somewhat fleshy stalks – one leaf per stem. The stalks get a red tint and thicken as they age. Leaves are 1.5 inches (4 cm) across. The plants can be up to 2 ft. (60 cm.) tall, but tend to be very heavy and sprawl along the ground. Flowers are small and delicate, about ½ – ¾ in. (1.5 – 2 cm.) across. They have five petals, which are white with purple or pink veining. When closed, they look like miniature rosebuds, but when open, you can clearly see the wavy edges of the petals (top photo). The nectar and pollen of the flowers attract primarily bees, including honeybees, bumblebees, Little Carpenter bees, Cuckoo bees (Nomadine), Mason bees, Green Metallic bees, and other Halictid bees. Other visitors of the flowers include miscellaneous flies and White butterflies, especially Pieris rapae (Cabbage White). The caterpillars of some Lepidoptera feed on mallows, including Anomis erosa (Yellow Scallop Moth), Pyrgus communis (Common Checkered Skipper), and the butterflies Strymon melinus (Gray Hairstreak) and Vanessa cardui (Painted Lady). The foliage is non-toxic and probably eaten by rabbits. Birds apparently make little use of the seeds. There's an awesome squidoo post about mallow that talks about eating it. Mallows are a good source of those “best friend” minerals, calcium and magnesium. They also contain potassium, iron, selenium, and vitamins A and C.
All parts of the mallow plant are edible — the leaves, the stems, the flowers, the seeds, and the roots (it's from the roots that cousin Althaea gives the sap that was used for marshmallows). One of the most popular uses of mallows is as a salad green. Mallows are high in mucilage, a sticky substance that gives them a slightly slimy texture, similar to okra. I prefer not to eat them alone because of this, but they're great mixed with other foods in a salad. 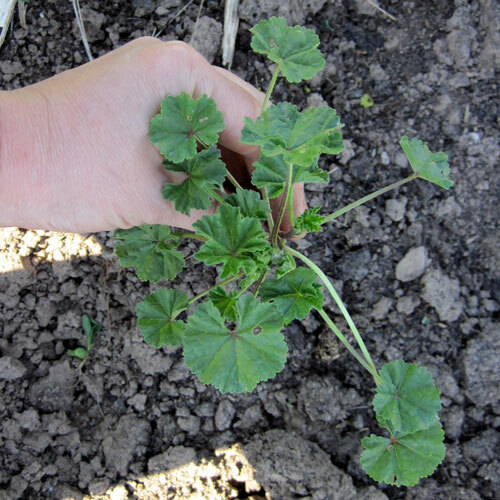 Please visit “Mallows – A nutritious edible weed” for more information and recipes. 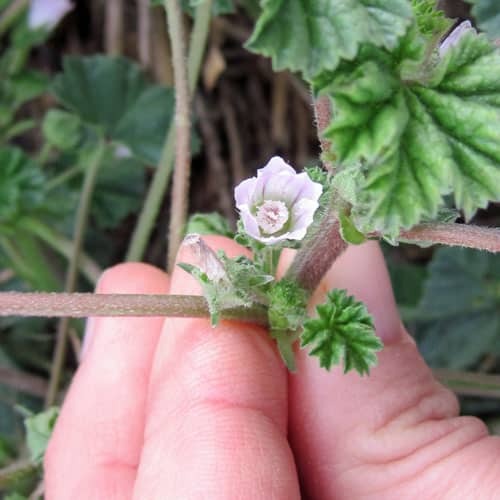 Herbalists employ dwarf mallow both topically and orally. 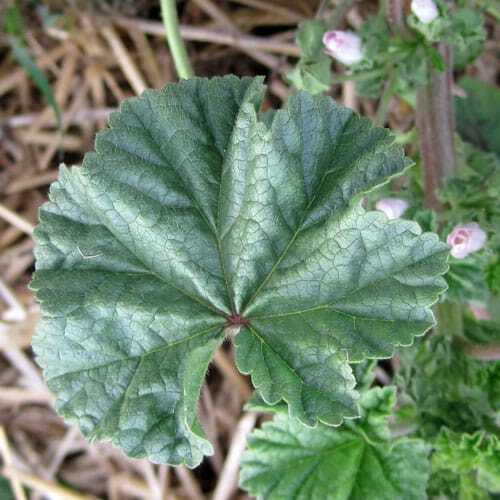 According to Plants for A Future, the online database for medicinal and edible wild plants, Malva neglecta is more frequently used as a skin-soother than for coughs or stomach upset because it is not as potent medicinally as marsh mallow. But that gentleness may make it useful as a laxative for children, the database notes. As a topical application, the mucilaginous leaves and flowers have demulcent properties, meaning they form a protective layer and offer some pain relief. Their gel-like texture provides internal relief for constipation, coughing and stomach upset. In laboratory testing, Malva neglecta provided protection from trauma to the gastric system. Germany's Commission E, which grades herbs for medicinal use, rates mallow plants useful for treating skin conditions, coughs and throat irritants. In the United States, Malva neglecta's status, as well as those of other mallows, remains relegated to folk medicine uses. Commercial blends of herbal teas containing mallow, however, are available. No serious side effects are currently reported from mallow teas for the general population, but Drugs.com warns that not enough is known to consider it safe for pregnant and nursing women. Additionally, its possible effect of lowering blood sugar makes Malva neglecta unsuitable for diabetics. Please visit “Medicinal Benefits of Malva Neglecta” to learn more. As always, any medical information is for informational purposes only. Always exercise caution when using any wild plants and make sure you have positively identified the plant. You can check out my favorite wildcrafting books if you like. Mountain Rose Herbs stocks many of the herbs and plants featured on Wildcrafting Wednesday. They also carry an assortment of bottles, droppers and other supplies, plus some really soft organic cotton t-shirts. If you choose to purchase through my site, I receive a small affiliate payment. Thank you! I’ve been looking forward to this weed because it grows in abundance at the same place I pick my plantain from. Thank you so much for doing these they have really helped. Thanks, Michelle. I’m glad you find them useful. “mallows neglected” – maybe because they thrive in neglected areas? This is frustrating — pretty much everything in my yard seems to be “not recommended for pregnant or nursing mothers.” I expect to be nursing for a lot longer, but would really like to try some of these. Do you know if it’s just medicinal doses we should be avoiding, or should I not even put any in my salad? Because most weeds have not been well studied, except in some cases to extract something that they can market as a drug, must health resource sites will caution avoidance for women who are pregnant or nursing. My feeling is that in small doses most are perfectly safe (unless there are other warnings), however I am not a trained health professional. Thanks. I figure since I’m nursing rather than pregnant, I shouuld be able to see any adverse effects right away and stop eating whatever caused it. Aha! This persistent “weed” has been coming up in my rock garden (literally, just rocks) for years. I never knew what it was. Perhaps I’ll try some tomorrow. Thanks for another great informative post! Isn’t it funny when you finally know what a weed is that you’ve been seeing for years? For me, it’s a little like learning something about an old friend that you never knew, and suddenly looking at them in a whole new way. I have not been able to find Malva neglecta seeds to buy. Anybody know where I can buy some? Folks on Dave’s Garden are willing to give some away – Dave’s Garden, Malva Neglecta. You might also ask around locally and see if anyone you know has it growing. It can be quite aggressive, so must people are happy to get rid of it. This is great information! Thank you. The donkeys at Equine Outreach Horse Rescue Ranch will munch on the plant in our walks around the grounds. Since this is high desert and donkeys are desert animals I trusted their instincts. I notice in Dave’s garden that he said you can find mallow in Denver Colorado but I want to know where in Denver..I live in denver and I missed eating mallow. My mom use to cook them all the time. I’d love to help you out, Naima, but I’ve only been to Denver once, and that was passing through the airport. I’d suggest asking whoever posted that they found it in Denver on Dave’s Garden. Otherwise, keep an eye open for neglected areas that are moist but not wet.